Craig Sutherland has more flavor with less calories. He builds strong bodies twelve ways. Craig is America’s sweetheart. 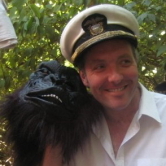 He rights wrongs and … what the hell is he doing with that gorilla head?